New fiberglass tubs are protected by a smooth, glossy material called "gel coat." With time and use, gel coat can wear down and leave a rough surface for dirt and soap scum to build up on. In that circumstance, the porous fiberglass tub usually requires a lot of scrubbing with conventional cleaning products. But did you know that fume-free oven cleaner can do the job? Use oven cleaner to remove even the toughest buildup with little effort. Open the bathroom door or window for ventilation. Spray and even layer of fume-free oven cleaner on the fiberglass, starting at the tub bottom and working your way up the sides. Avoid any metal trim, as oven cleaner could damage the finish. Allow the oven cleaner to sit on the fiberglass tub for one hour. 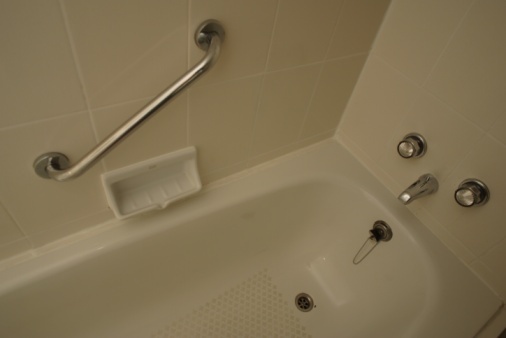 Wipe the fiberglass tub with a damp cloth or sponge to remove the oven cleaner residue. Rinse the fiberglass tub with clean water and dry it with a towel.